James's Flamingos are feeding in a shallow lagoon at 4,500 meters, close to the border with Chile. The Salvador Dali desert - a wilderness where raw minerals - zinc, copper, silver - infuse the landscape, painting a vivid, surrealist canvas of perplexing scale in which geological time is the only real measure. 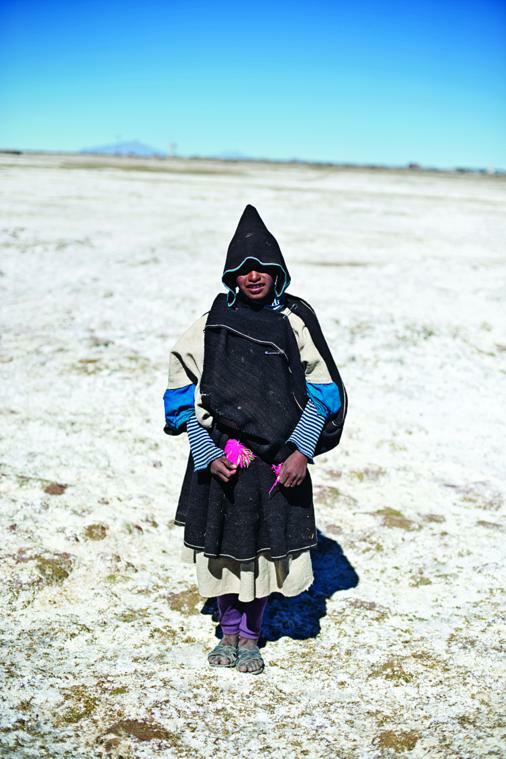 Traditionally, Chipaya women wear a white dress as an undergarment, with a dun coloured woollen poncho over the top for warmth. Eloi Mamani Alabi prepares coca leaves for chewing outside his home as his wife steps inside. Samuel Mamani Chino gazes across the tundra as he prepares to go hunting for flamingos. 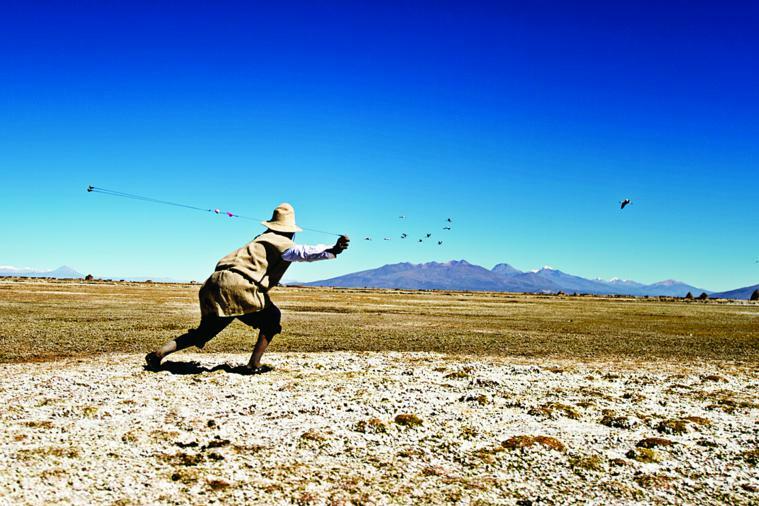 As a low flying flock of flamingos approaches, Jose Luis Mamani Chino leaps to his feet and swings his sconi throwing weapon - versions of which are used throughout the Andes. 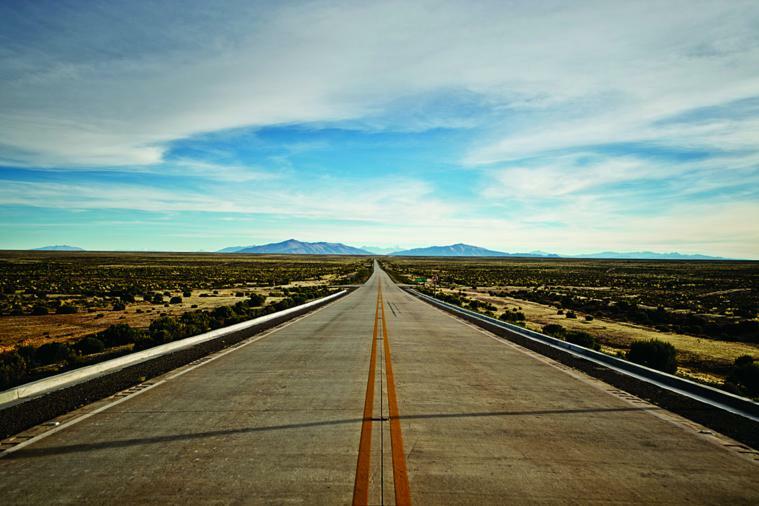 This highway when complete will greatly improve the transportation of raw materials between Bolivia and Chile. 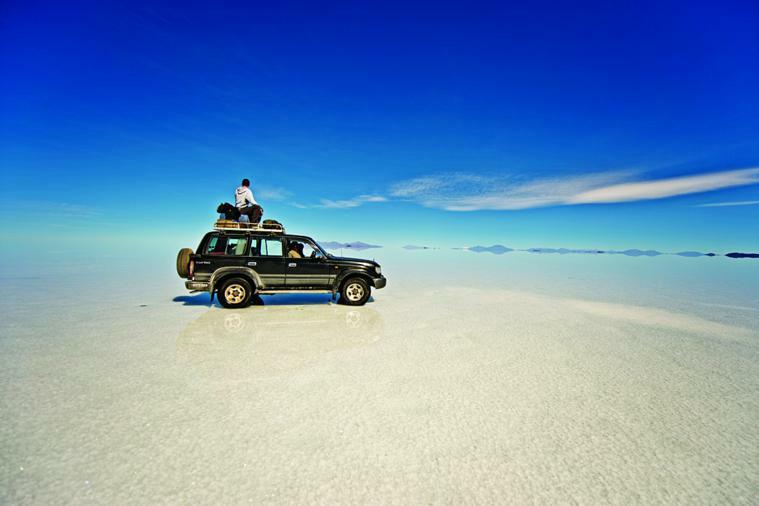 Salar De Uyuni is the largest salt flat in the world, a breathless 3,600 meters above sea level. Jose luismamani Chino crouches motionless on the plain, waiting, his llama-wool poncho almost invisible against the salt-encrusted earth. A flock of flamingos flaps lazily across the high Andean sky. The second they come within range, the young Chipaya Indian springs to his feet, whipping a weighted nylon cord round his head three times before letting it fly. The bola strikes its target; in a chaos of pale pink feathers, the bird plummets to the ground. As the 10-year-old trots off to fetch his catch, I’m still trying to square the whole spectacle with… well, anything familiar. Flamingos are typically associated with the tropics. But we’re on an arid, wind-whipped plateau high in the Bolivian Andes, snow-capped volcanoes breaking the horizon, and a kid in a poncho has just killed one of these beautiful, iconic creatures at 60 meters with a piece of string and a couple of lead balls. Not for sport, mind you—for Jose Luis and his family, flamingo meat is a welcome supplement to their subsistence diet. The bird is destined for the night’s stew pot. Today numbering about 2,000 people, the Chipaya are the living relic of an ancient past. They are descended from some of the first inhabitants of South America, predating the Inca by perhaps two and a half millennia. 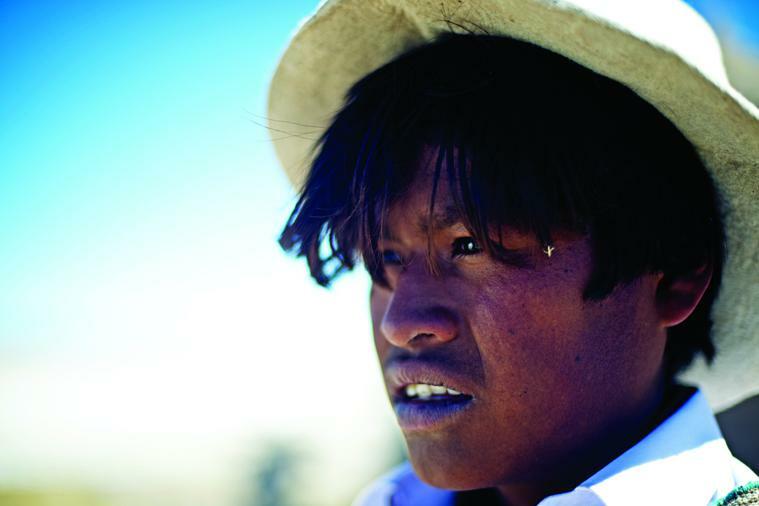 They speak their own language and live apart from the Quechua and Aymara ethnic groups that dominate the Bolivian Altiplano, a rugged tableland stretching from Lake Titicaca to the borderlands of Argentina. At an average elevation of 3,700 meters, it is the world’s second-highest mountain plateau after Tibet. Considering the rarefied air and harsh microclimates, it’s perhaps surprising that humans chose to live up here at all. Yet the Altiplano has seen the rise and fall of some of South America’s greatest civilizations. It’s a legacy of conquest and empire that continues to infuse the indigenous cultures that live there today. The languages of both the Quechua and Aymara peoples can be traced back to the Tiwanaku civilization, which held sway in the region around Lake Titicaca from around 400 A.D. until 1000 A.D., while the pigtails and bustle skirts of the Aymara women have changed little since Spanish colonizers introduced them more than three centuries ago. Potato and quinoa have been staples since prehistoric times, as evidenced by the remains of ancient agricultural terraces that crisscross the mountainsides. You don’t have to dig deep to get a sense of the past here; the Bolivian Altiplano wears its history on its sleeve. My journey begins in La Paz, a city that distils its country’s past and future in a way that few other capitals do. La Paz is not, in fact, Bolivia’s judicial capital—that distinction belongs to the picturesque colonial city of Sucre, 400 kilometers to the southwest—but it is home to the executive and legislative branches of government, and serves as well as the country’s manufacturing hub. La Paz also enjoys one of the most singular settings in the world. Regiments of skyscrapers stand against the steep sides of a valley, the buildings rendered toy-like by the sheer scale of the landscape reflected in their windowpanes: a primordial desert of shattered rock and distant snowcaps. The streets throng with Aymara and Quechua farmers; with businessmen, intellectuals, and an emerging middle class that likes to gather in boutique cafés like La Guingette or Alexander Coffee. I spend a few days acclimatizing to the altitude in a comfy apartment hotel in the quiet Sopocachi neighborhood, a short drive from central La Paz. Fresh bread rolls arrive each morning, and in the kitchen I find coffee, tea, and coca leaves, which locals swear by to stave off altitude sickness. My arrival happens to coincide with one of La Paz’s biggest festivals, La Fiesta Del Gran Poder. People throng the Prado, the city’s central avenue, as colorful dance and music troupes from the countryside parade through the street. Some of the best perform in front of the baroque facade of the San Francisco Church, their dances a heady jumble of Catholic and pre-Columbian symbolism. The fiesta culminates in a street party near the main sports stadium, fueled by copious amounts of Paceña beer. I’m dragged into a stumbling dance with a jovial Aymara woman whose considerable girth seems to be the only thing keeping her standing. Keen for at least a few hours’ sleep before embarking on my Altiplano adventure, I eventually puff my way back through the steep cobbled streets in search of a taxi. A friend has connected me with Surtrek, a company that runs packages and bespoke driving tours across Bolivia and Ecuador. They in turn have set me up with Joel Estelo, a veteran guide whose swarthy features and wrinkled brow are testament to 15 years of roaming the high plains. His first order of business when we meet the next morning is to take me shopping for a few Altiplano essentials: sunglasses, sun cream, thermal underwear, a good sleeping bag, and a hot-water bottle. The equatorial sun burns bright in these highlands, but at night, temperatures can drop to well below freezing. The main road out of town—Ruta 1—passes first through El Alto, an apt name for a place that sits 4,000 meters above sea level. Once a suburb of La Paz, El Alto is now among Bolivia’s fastest growing urban centers. It was effectively built by rural migrants, who flooded here in the 1970s and ’80s to escape poverty in the countryside. The majority of its million-strong population identify themselves as Aymara, although first-generation alteñas are increasingly forgetting their ancestral tongue as they forge new urban identities. Where La Paz hugs the sides of a valley, the low-slung brick buildings of El Alto huddle on the high plain. It has a strange air of temporariness, as though the Andean winds might one day blow it all away. Beyond Oruro—an old mining town that is brought to life once a year by one of Latin America’s biggest carnivals—the highway dissolves into long stretches of unpaved road. The landscape is stark and comfortless, softened only by tussock and resinous tola scrub. I spot the occasional adobe village that seems to have risen from the earth of its own accord. 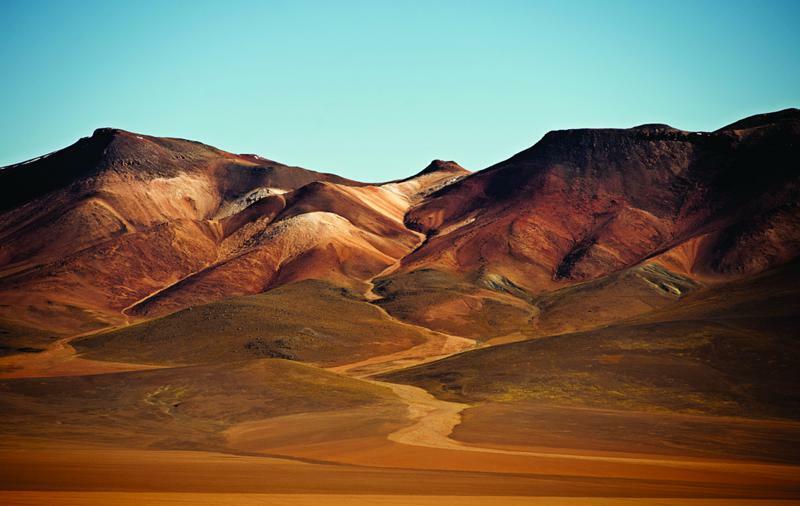 Not so long ago, the only vehicles in this wilderness were 18-wheel tanker trucks and a private railway, which has ferried nitrate and copper from Bolivia’s landlocked mines to the Chilean port of Antofagasta since the 1870s. Over the last decade, however, southwestern Bolivia has become increasingly popular with tourists. 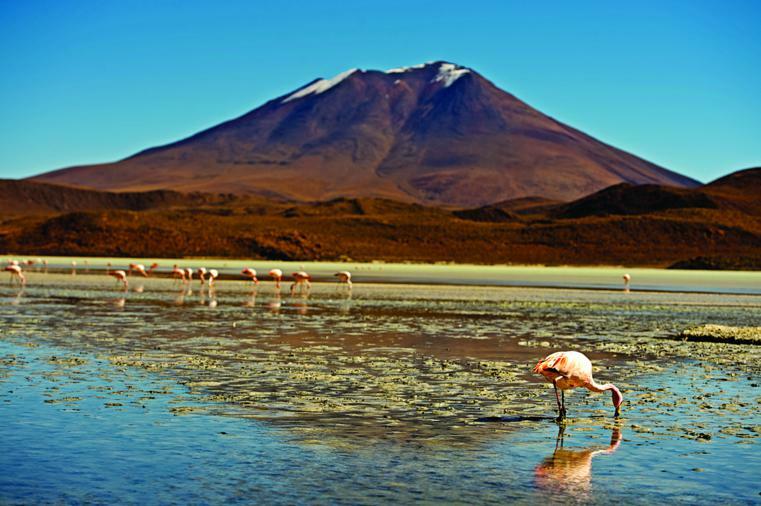 Convoys of four-by-fours now speed across the region each day, filled with venturesome visitors on whistle-stop tours of such geological spectacles as the Salar de Uyuni—the world’s largest salt desert—and the crimson, plankton-rich waters of Laguna Colorada, a haven for James’s flamingos. Yet the Chipaya seldom have any guests. 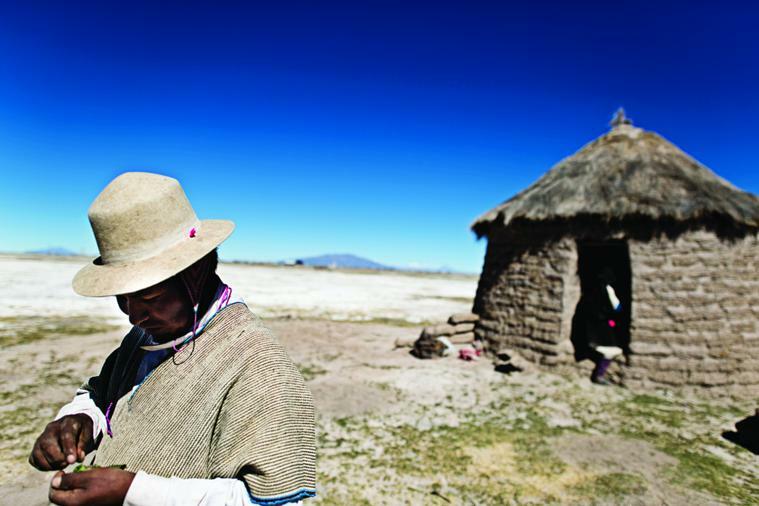 They live in and around the remote settlement of Santa Ana de Chipaya, on the starkly beautiful pampas that fringe the Coipasa salt flat, a smaller version of the Salar de Uyuni. The village itself is nondescript: adobe houses with corrugated iron roofs, a church, a cemetery. Most Chipaya still live out on the plain, building circular dwellings of mud and thatch near the Lauca River. Swelling and receding with the seasons, the river is their lifeblood, providing just enough water to grow quinoa and sustain herds of llamas and sheep. EloiMamaniAlabi, 37, welcomes us outside his house. He’s wearing the distinctive dress of a Chipaya male: felt hat, homespun shirt, llama-wool poncho, crude sandals. His wife’s poncho is darker and hooded. She sits at a loom weaving a blanket, manipulating the thick threads with a stick and a shell. Their sons Samuel and Jose Luis soon appear. Veronica, their daughter, peeps out shyly from the doorway. When I ask Eloi where the Chipaya came from, he says, “We have always been here. Before the chullpas we were here.” Chullpas are the ancient funerary towers, some 12 meters high, that can be found scattered throughout the Altiplano of Peru and Bolivia. Many still contain human remains, thought to be the ancestors of the present-day Aymara. The oldest are pre-Incan, dating back at least 1,500 years. But the Chipaya are older still, the last remaining descendants of the Uru people, who populated the vast Andean plains thousands of years before the Aymara arrived. Like all indigenous Andean peoples, their religion is a syncretism of Christianity and animistic belief, and they revere Pachamama, the earth mother. After joining Jose Luis on his flamingo hunt, I watch as he and his father squat plucking the bird’s feathers on the ground outside their house. Veronica sits nearby distractedly winding thread around a spindle, while her mother prepares a fire of tola brush inside. It could be a scene from centuries ago. But this sense of suspended time soon passes. On the drive back through Santa Ana, I spot some Chipaya boys who’ve climbed on top of a wall. They’re trying to get a mobile-phone signal.